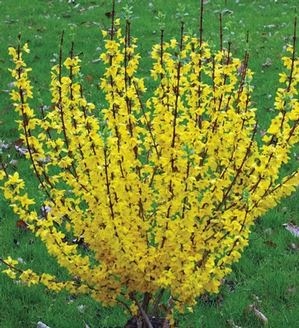 Everyone seems to enjoy the bright yellow flowers that forsythia bring to the early spring landscape but not everyone has the space for the full sized shrub that can easily reach 8' tall. Now there are miniature and dwarf varieties available! These jewels ranging from 16" - 36" as lovely in containers, mixed in perennial borders or added as accents among broadleaf evergreens and conifers. Dwarf Mini Gold, pictured above, is lovely in a container mixed with herbs and annuals. At only 16" - 24", it's the smallest variety that I've found. Show Off Sugar Baby is a close second at only 18" - 30". Sugar Baby is a Proven Winner so should be easy for do-it-yourselfers to find at nurseries who participate in that program. The dwarf variety from Proven Winner is Show Off Starlet at 24" - 36". Others in this size range include Arnold's Dwarf, Goldilocks, Gold Tide, Happy Centennial and Golden Peep. Dwarf and mini varieties pack more flowers per branch than old fashioned varieties. Some even hold their flowers for longer periods of time. Most have upright, erect stems rather than arching stems. 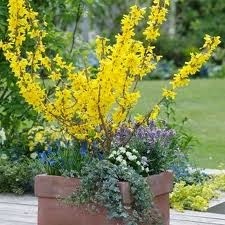 Forsythias are tough plants that can be used in any sunny to part sun area of the landscape. They are very forgiving of soil types, help to prevent erosion on hillsides and are even deer resistant! Looking forward to using these in my designs! 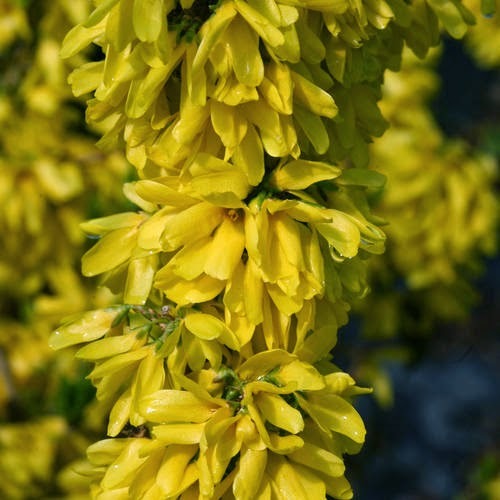 Are you ready to add this lovely yellow shrub to your landscape? Then contact me to schedule your Initial Consultation or Garden Walk now!